A −5.0 C charge is being forced south by a 60 N force. What are the magnitude and direction of the local electric field? This is College Physics Answers with Shaun Dychko. Negative five Coulombs is being forced south, with a force of 60 Newtons and the question is: What is the electric field? 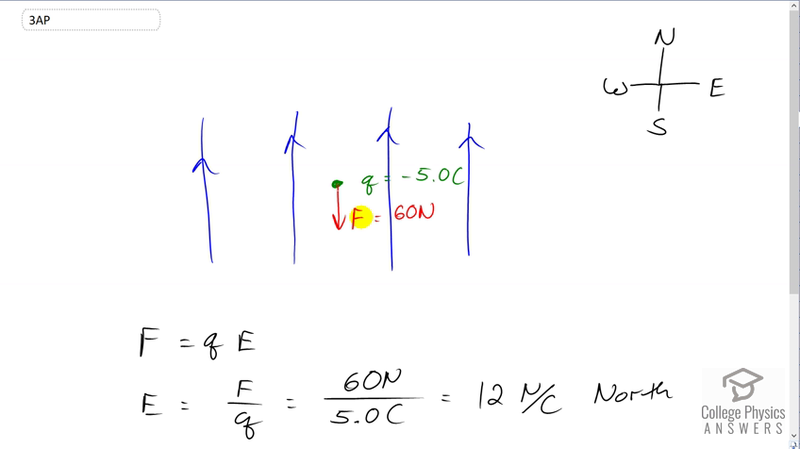 So, the direction that the electric field points is the direction of force that would be applied when a positive charge, so since the force is downwards and this is a negative charge, the electric field must be pointing up in order to be in the opposite direction. And, we can use this formula to figure out the strength of the electric field. And, we'll divide both sides by Q. And, we have that the electric field then is the force divided by the charge. So, that's 60 Newtons divided by 5 Coulombs, which is 12 Newtons per Coulomb. And, this is a field directed towards the north, and it is option B.